In Ecuador, climbers Matthias Liebert (Greensboro, NC), Alexandra Levin (New York City) and Michael Brennan (Scranton, PA) with AAI guide Jose Landazuri summited 18,997-foot Cayambe a little after 10:00am on Thursday, February 28th. 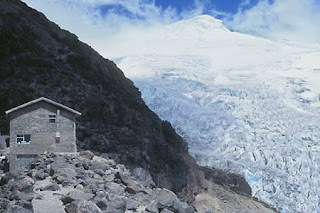 Cayambe and its hut. The icefall in the bottom right is where the climbing team practiced skills before making their successful ascent. Chuck Park photo. Cayambe hasn’t seen any successful climbs all the way to the summit for the last month because of a huge crevasse surrounding most of the very heavily glaciated summit formation. This team circumnavigated the summit pyramid far enough to find a new passage to get past this final crevasse – thanks in part to their thorough scouting and to some new snow and ice collapses. They report “the weather and the climbing were both great,” in a call from the mountain. Everyone was doing very well and looking forward to relaxing in the comforts of La Cienega Hacienda today before moving on to Cotopaxi tomorrow March 1st. They’ll make their summit bid on Cotopaxi on March 2nd. 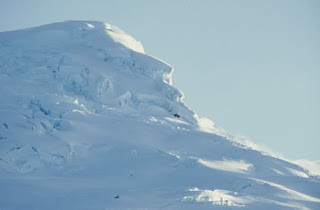 The large crevasse surrounding the summit of Cayambe was surmounted on the southeast side of the peak, out of view here to the right. Melissa Park photo.